The Eighteenth Amendment to the Constitution, which banned the “manufacture, sale, or transportation of intoxicating liquors,” took effect on January 16, 1920. It became known as the National Prohibition or Volstead Act. This new law required physicians to obtain a special permit from the prohibition commissioner in order to write prescriptions for liquor. The patient could then legally buy liquor from the pharmacy or the physician. However, the law also regulated how much liquor could be prescribed to each patient. There were no provisions for the prescription of beer. In the 1920s, alcohol was known as an ancient therapy that still held medical value with some physicians. It was widely used through the 19th century, although its scientific value was beginning to be questioned by the turn of the 20th century. Part of its popularity was due to its low cost and availability. It was used as a tonic, stimulant, preventive measure, and even as a cure for acute illnesses. Whiskey and brandy were used most often, but use generally varied considerably from physician to physician. Alcohol was prescribed for a variety of ailments including anemia, high blood pressure, heart disease, typhoid, pneumonia, and tuberculosis. Physicians believed it stimulated digestion, conserved tissue, was helpful for the heart, and increased energy. 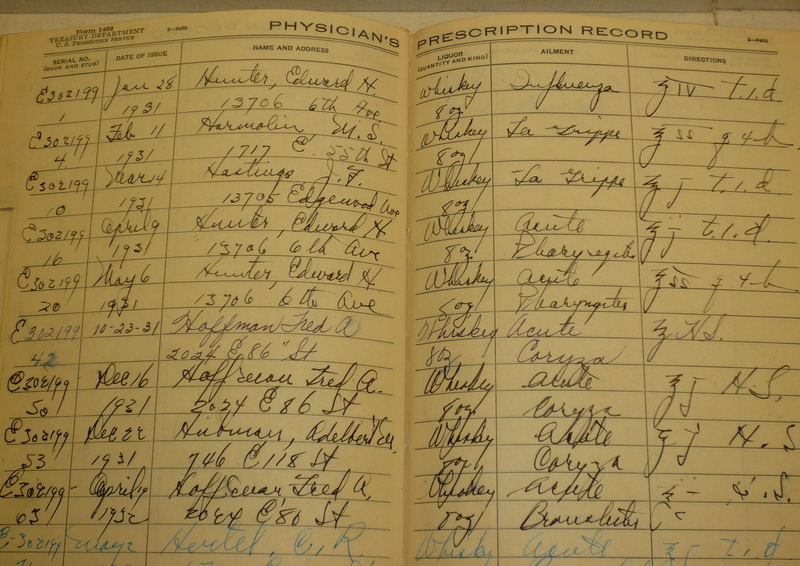 Patients of all ages used alcohol. A common adult dose was about 1 ounce every 2-3 hours. Child doses ranged from 1/2 to 2 teaspoons every three hours. In addition to their right to prescribe alcohol for its therapeutic value, American physicians also united to protest the encroachment of Congress on their right as doctors to treat their patients with whatever means they deemed necessary. They were not fighting against prohibition, but against the government’s growing jurisdiction over their practice of medicine. Although the medical community tried to win back their autonomy through numerous court cases, appeals, and resolutions, none of them were successful. Prohibition was finally repealed by the 21st Amendment on December 5, 1933. This struggle over the Volstead Act marked the first time that the medical community had taken a stance against federal legislation. Previous laws concerning health and medicine had been largely supported by the nation’s medical community. The unsuccessful protest of physicians during prohibition began a new phase in government regulation of medical practice. Modern parallels can be seen in the debate about medicinal marijuana and mandatory health insurance. These laws, like the National Prohibition Act, will affect the interaction of physicians with their patients. Appel, Jacob. 2008. Physicians are not Bootleggers: The short, particular life of the medicinal alcohol movement. Bulletin of the History of Medicine 82: 355-386. Rothstein, William G. 1972. American Physicians of the Nineteenth Century. Baltimore: Johns Hopkins University Press. The elephant in the room here is the prohibition of cannabis. It has been shown to have medicinal value just as alcohol was, which seems to foreshadow its inevitable decriminalization. Well, the medicinal properties of alcohol has since been disproved. You have a point that the use of the substance as a “medicine” seems to foreshadow decriminalization though. I’ve got a full bottle intact and in it’s original packaging from my grandfather. How can I find out what it’s worth? It’s never been opened. The ‘medicine’ is still intact. Your best bet is to find an appraiser who specializes in medical antiques in your area. Try asking at an antiques store to find a reference. This is a very interesting article. One hears comedians speaking about their using alcohol “for medicinal purposes only,” but here is the true story. One can’t help but wonder where they got the stuff to prescribe after the Volstead Act went into effect (since it was illegal to manufacture, transport, sell, and consume alcohol between 1919 and 1933). Did the government stockpile the stuff? Or, was most of it imported (via Canada and Mexico)by government contractors? I also imagine that trips to the doctor increased in number. The material we have at the museum includes letters from an “American Medicinal Spirits Company, Inc.” out of Kentucky. It seems that they are the ones who sold the doctor his whiskey and sherry wine. This company must have been approved by the government to manufacture or import alcohol for “medicinal” purposes. There are also shipping receipts. I’ve been to the Yuengling brewery in Pottsville, PA. During the tour, they talk about the lengthy process of making beer, but then make a tongue-in-cheek comment about how the day it was repealed that their trucks were lined up and ready to roll, meaning that they were still making alcoholic beverages at a time when they say they were only making near beer. 19th century doctors in the U.S.